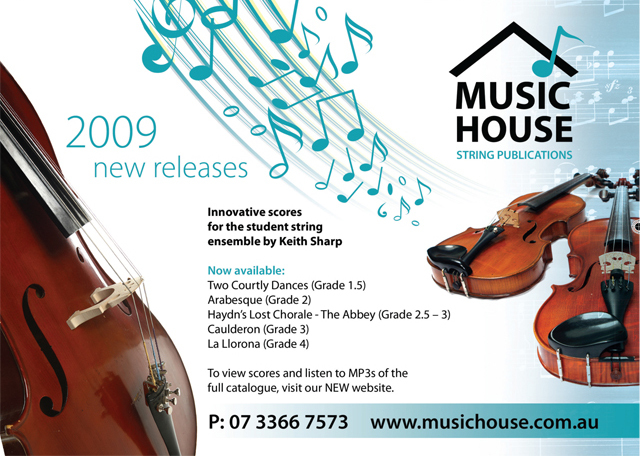 Music House String Publications is dedicated to the notion that teaching children the skills of playing musical instruments is a vital part of education. A powerful catalyst in the process of instrumental learning is the provision of music scores that are delightful to teach and an exuberant pleasure to learn and play. This website presents a range of original, dynamic and educational compositions and arrangements for string ensembles at primary and high school levels. 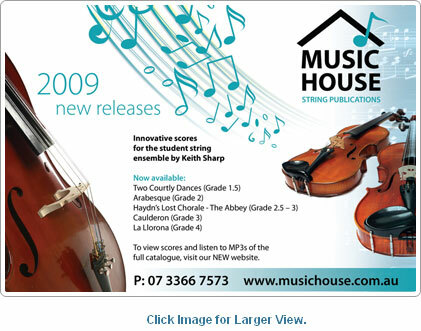 The music is written by Keith Sharp who has worked with string students since 1985. Each piece has been trialled extensively before going to press. We personally guarantee the usefulness and workability of every piece. The compositions are refreshingly original, varied and carefully designed to help teachers further their students’ technique and ensemble sense. Musical interest is shared throughout the ensemble, the themes are memorable and many of the pieces include piano accompaniment. The scores and parts are printed on quality paper stock and are immaculately typeset and edited. Each set comes in a durable and attractive folder. Please listen to some of the pieces, view the scorch file scores and check the teacher & student testimonials. A printed catalogue and free sample CD are available upon request. We hope that you will find the time to test one of our scores and discover the inspiration and musical momentum that such pieces can bring! Keith & Natalie Sharp are co-authors of these popular, Australian beginner book/CD sets, published and distributed by Accent Publishing. Level 1 & 2 are available for violin, viola, cello and double bass. New Accompaniment books provide a variety of acoustic/ ensemble performance possibilities.